Konnichiwa! My name is Jen and I blog over on Motu Viget. I write about my adventures living in Japan as well as other important things like life goals and dessert. I'd love it if you popped over to say hi! I'm really honored to be able to write a guest blog for Five Sixteenths. Moe and I may be a world apart at the moment but I know we're both in for big changes this summer. She's anticipating a move to be with her sweetie, Zach, while I'm preparing to move back to the U.S. after three long years abroad. Living in Japan has really been amazing and I know it will forever be a part of my life. Some places just stick with you, like your home town, first apartment or (in my case) a little city called Aizuwakamatsu. In honor of those special places we all have, I'd like to show you an easy wall art DIY to help you keep them close wherever you are. First, you'll need to choose which places you'd like to feature in your art. 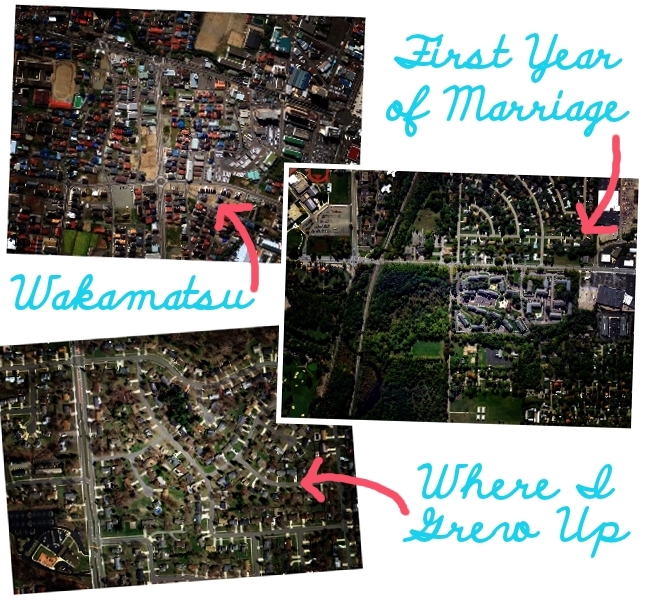 I chose my neighborhood in Japan, the apartment my husband and I lived in during our first year of marriage and my childhood home in Michigan. Using Google Earth, which is free to install, do a search to bring up the satellite image of that area. Play around with the zoom and placement to find a shot you like. You'll notice that streets and other locations will be marked on the map at first. Disable these labels by unchecking all the boxes at the bottom of the sidebar. Now, disable the sidebar itself by clicking "View" and unchecking sidebar. Since we're using the free version of Google Earth, we will need to take a screen shot of the satellite image. Be sure your cursor is at the top or bottom of the screen so it doesn't appear in your image! Take a screen shot and save the image. Repeat this process for however many places you'd like. Google Earth is pretty awesome, but the image quality isn't always so great. We'll need to use some photo editing software to fix up our screenshots. (I use GIMP and love it. It's free! Learn more and download it here.) Crop your image to remove the menu bar, of course. My satellite images were a bit washed out, so I adjusted the levels and increased the contrast. I also added a vignette layer and played around with the curves until I found an effect I liked. Satellite images look really cool with a vintage or antique photography filter. Play around with them until you find something you're happy with. I love seeing the contrast in the different places I've lived. The differences in population density are very apparent! I hung my set of three photographs in our kitchen and I definitely plan on bringing them with us to the U.S. Perhaps I'll keep adding to the set for every place we call home! 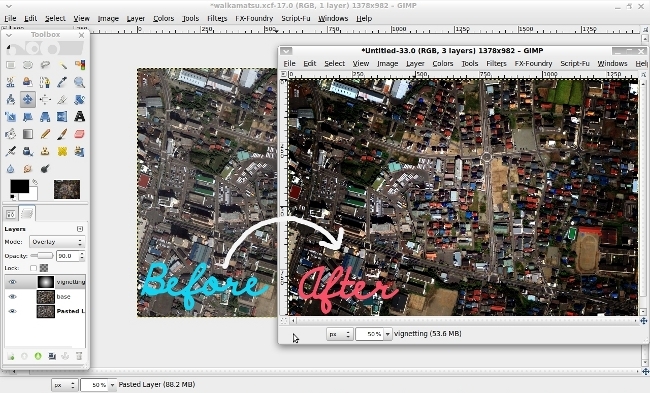 A Little Disclaimer: All satellite images © 2011 Google. 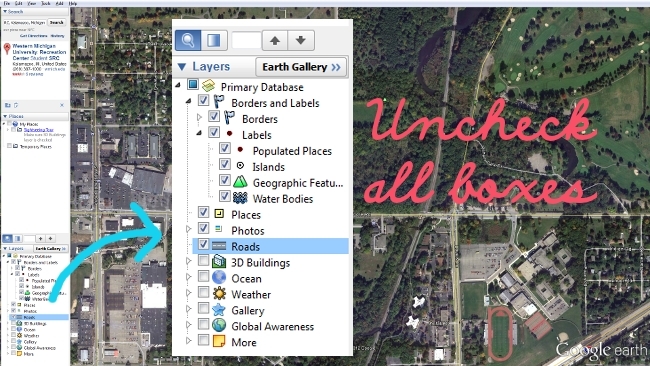 And remember, you can use Google Earth imagery for personal use, but cannot sell it to others. View that policy here. See guys! Isn't this the coolest! Honestly I can't wait to try this out when I move. If you'd like to give a huge awesome compliment to Miss Jen, head on over to her blog, connect with her on twitter, or say hi on Facebook. Check out more from past Feature Sponsors & Guest Posters here. If you're interested in being a Feature Sponsor for the month of August, please head on over to the Sponsor Page, then shoot me an email. If you're interested in being a part of Five Sixteenths through a guest post, peep the guidelines here & the contact me, I'd love to work with you! Oh I love this, I'm totally doing this this week! I love this! I would love to print out all the places my hubby and I have lived! Awesome post! This is an awesome idea! We're definitely going to do this in our new house! Thanks! I am doing this for the town where I live in Scotland. I have ordered a wallpaper map of the area. I am so delighted with it. Find wall art, canvas art, framed art, metal art, kinds of art, wall murals, hand painted art with lowest and competitive prices, from online shopping, online stores, with quality products.